Some were not shocked recently hearing of the arrest of long-time friend of felon Bernard Kerik, Frank DiTommaso, being arrested for brutally assaulting Kerik Informant, Larry Ray. Some dare to think Kerik may have been involved in some way. Investigation is ongoing in this case and every defendant is considered innocent until proven guilty, of course. However, we also remember how, instead of a physical assault, another former friend of felon Bernard Kerik, Joe Tacopina, was defamed, brutally and verbally assaulted in open published media. Bernard Kerik, through filings by his unscrupulous attorney, Timothy Payne Parlatore, inferred without any real evidence, Joe Tacopina was hooked on prescription drugs, had adulterous affairs and was a candidate for a "Rico" charge. Joe Tacopina and lawyer, Judd Burstein, fired back with a $5million defamation suit against Kerik heading for jury trial this fall. We have learned felon on probation, Bernard Kerik, allegedly has also recruited an NYPD Auxiliary Officer, Martin T. Green, in an errily similar pattern, to harass and defame the Plaintiff Co-Author, Dara DAddio, in an ongoing copyright infringement case against Kerik also active on the docket in the Southern District of New York (1:2015-cv-05497 S.D.N.Y.) where she contends Kerik published and profited from "From Jailer to Jailed", using her work without her permission or compensation. There is a crime called "Witness Tampering" and, if proven against Kerik, could violate his federal probation and send him back to prison! Open Social Media posts on twitter out this ugly pattern of revenge by NYPD Auxiliary Officer Martin T. Green who has two twitter accounts both associated with the NYPD; @marting78651306 and @nypd_cttf. 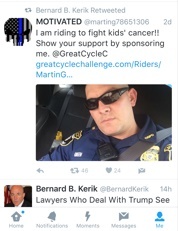 Felon Kerik did retweet Green's pinned tweet exposing an association. By all accounts, NYPD Auxiliary Officer Martin T Green is a self-promoting maniac who apparently enjoys seeing his portrait on social media and appears as a rabid cop wannabe akin to only the likes of George Zimmerman. Green is an auxiliary officer which means he carries no weapon, has limited powers in the NYPD uniform reducing his role to traffic enforcement. Judging by his tweets on both NYPD twitter user accounts he enjoys self-portraits, extreme motivational phrases and selling unauthorized NYPD Patches and "martial arts videos" he claims will fulfill a "self defense" requirement for NYPD Auxiliary training. Ms DAddio declined to speak to us about the NYPD investigation although she did express continued concern for her safety. 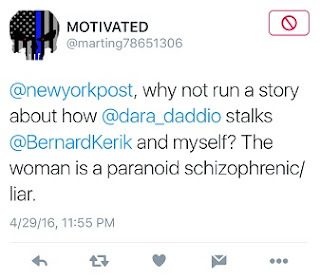 Ms DAddio has observed Kerik's harassment recently amped up from ugly defaming public attacks on her reputation to the sudden increase of guns & knives postings on felon Kerik's social media. She also expressed a special concern with Kerik's recent boasting of giving his children "whacks and cracks" as discipline. Ms DAddio expressed these are a "disturbing trends for anyone let alone a felon on probation". 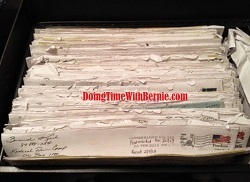 She is disappointed the US Dept of Probation (the agency appointed to supervising Kerik) as well as the Franklin Lakes Police Department (Kerik's hometown police force) have "laughed off" her concerns and refused to document or investigate her attempts to reports this disturbing violent threatening trend. NYPD is investigating within Internal Affairs. Ms. DAddio has requested a parallel criminal investigation. The NYPD declined to comment further as investigation is ongoing. Stay Tuned.